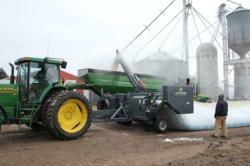 Unloader provides fast, reliable unloading of grain storage bags. Loftness offers the new GrainLogix™ GBU12 grain bag unloader for fast, reliable unloading of 12-foot-diameter grain bags. Every aspect of the GBU12 Grain Bag Unloader has been rigorously field tested and refined to maximize durability. The GBU12 includes 12-inch horizontal augers to collect grain from the storage bag and a 17-inch main auger to deliver it to a trailer or grain cart. It is capable of filling a 1,000-bushel trailer in approximately 5 minutes. The high-torque, chain-driven bag roller includes welded teeth to squarely secure the bag, and it features large end caps to keep the bag on track. Additionally, the machine comes equipped with a dual-position knife, which can be adjusted according to the bag shape. After a bag is unloaded, the roller clutch can be engaged by hand to quickly and easily remove it. All functions are powered by a central hydraulic system with inline pumps and a time-tested, hydraulically driven cooling system. The controls have easy ground-level access to precisely regulate the bag roller speed, adjust the axle height, and retract or extend the hinged main auger. Every aspect of the GBU12 has been rigorously field tested and refined to maximize durability and meet the heavy-duty demands of 12-foot bagging operations. Additionally, industry-standard, off-the-shelf parts have been used throughout the design, allowing many operators to conduct their own repairs in the field. Furthermore, the GBU12 is highly transportable, thanks to its foldable main auger and heavy-duty axle with electric brakes. The GBU12 requires a tractor with a 1,000-RPM, 150-horsepower PTO. A variety of drive shaft spline options are available to accommodate multiple PTO output shaft profiles. Loftness manufactures the GrainLogix line of grain-bagging equipment, the CropLogix line of crop shredders and the VMLogix line of vegetation management equipment. For more information on Loftness’ complete product line, contact Loftness Specialized Equipment, P.O. Box 337, Hector, MN 55342, call 800-828-7624 (U.S. and Canada) or 320-848-6266 (international), email info(at)loftness(dot)com, or visit http://www.grainlogix.com.